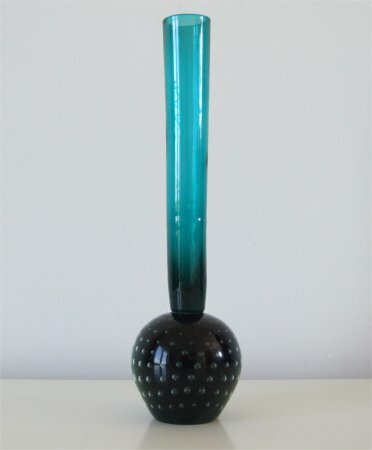 This vase is approximately 154mm (6 inches) tall. 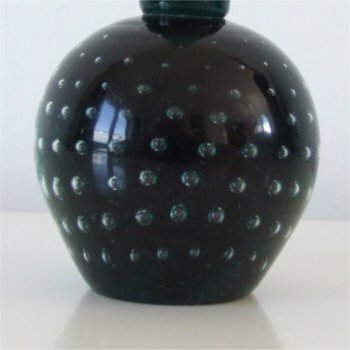 The base is heart shaped, with large bubbles arranged horizontally around the ball. The colour is a deep bluey/green, (slightly greener than the photo shows). The bottom of the base is 'ground' flat and polished. The stem is the same colour as the base, with a narrow flare, and measures approximately 18mm (3/4 of an inch) in diameter. 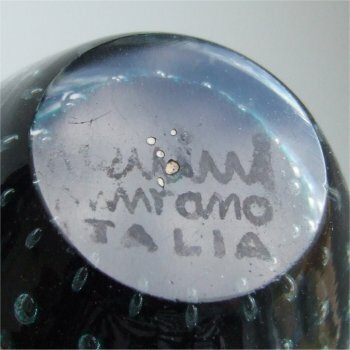 There is a slightly worn acid etched mark on the base stating, 'Venini Murano ITALIA' (see images below).